Belize Condos for Rent at Playa del Consejo! Nestled on the edge of majestic Corozal Bay, Playa del Consejo is a newly developed community in Consejo Shores offering residents Belize Condos on the beach. 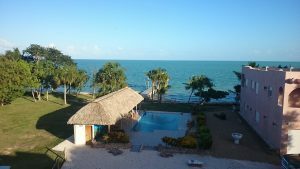 The condominium is located just outside of Corozal Town, Belize and only fifteen miles from the neighboring Mexican city of Chetumal. As its name suggests, Playa Del Consejo is the beach of Consejo Shores (one of the most highly recommended places to retire in Belize) featuring beautiful water front homes in Belize. Each of our condos for has an stunning view of the sea. Enjoy the modern amenities of these newly built oceanfront condominiums in this serene seaside community. Run away from harsh winters and wake up every morning to clear skies and mesmerizing turquoise waters in your Belize home inviting you to indulge in endless possibilities of outdoor activities. Show off your skills at the 9-hole golf course or enjoy a fishing day at sea. The warm tropical climate and cool breezes make every day the perfect day. Retire in Belize and join us at Playa del Consejo. Where should you Live in Belize? Your home in Belize at Playa del Consejo Condominium is very accessible. Just a mere two-hour flight from the USA and you’re in Belize! From the Phillip S.W. Goldson International Airport near Belize City, you can choose to arrive in Corozal on either a quick 30-minute flight or a scenic 85-mile drive through many towns and small villages including the main district of Orange Walk, famously known as ‘Suga City’. The Consejo Shores development, which houses Playa del Consejo, is located 7 miles north of Corozal Town in quiet Consejo Village. Just upon the shore of the Corozal Bay is where Playa del Consejo is waiting for you to come choose one of our condos that’s right for you! Retire in Belize’s Best Retirement Community! According to an article on AARP.org, “Corozal expats live a laid-back life, with year-round outdoor play (boating, hiking, swimming, diving), but are still only 20 minutes from the malls and Cineplex’s”. These are only a couple of the many features that make Corozal, specifically Consejo Shores, the place to retire in Belize. 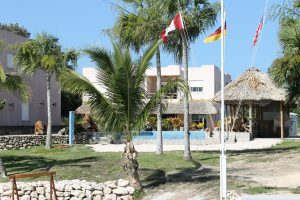 The Belize retirement village of Consejo is known to be a very quiet, relaxed place, with one of the lowest crime rates in the country. Just north of the village lies Consejo Shores, the best planned retirement community in Belize catering mainly to expatriates. Playa del Consejo makes retiring in Belize even easier by accommodating you with some of the most affordable beachfront condos in Belize. With a host of onsite amenities like the swimming pool, gazebo, and boat dock, Playa del Consejo offers you the complete package when planning to retire in Belize with beautiful condos and homes for sale in Belize!